Buick-GMC chief Brian Sweeney: To attract younger buyers, Buick will create cars with better performance and technology. DETROIT -- Buick-GMC's new chief inherits a familiar challenge: change consumers' perception of the Buick brand. "Buick's an older person's vehicle," says Brian Sweeney, describing the public's view. "What can we do to reverse that?" 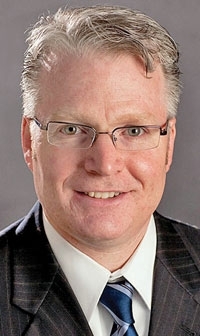 Sweeney, a 42-year-old sales and marketing executive at General Motors Co., became general manager of Buick-GMC on Dec. 17. GMC, Sweeney says, is in good shape. Attracting a younger Buick clientele poses his greatest challenge. To be clear, "younger" doesn't mean people in their 20s, says Craig Bierley, Buick's product marketing director. Younger, he says, means people in their 40s and 50s. While the average age of a U.S. car buyer is 52, the average age of a buyer of a Buick sedan is 70, Bierley says. That is changing. More than a third of the buyers of the 2010 LaCrosse are 55 or younger, Bierley says, up from fewer than than 10 percent of the previous version's purchasers. Part of Buick's strategy is to create vehicles with better performance and technology. Sweeney is counting on the Regal sedan -- a reworked Opel Insignia coming in the spring. The other part of the strategy is showing Buick to consumers. Much of the Regal's advertising will be "experiential marketing," Bierley says. Buick started with the 2010 LaCrosse, taking the car to coffee shops, art fairs and wine festivals. Sweeney is the third head of Buick-GMC in a month. He replaces Michael Richards, a former Ford Motor Co. executive who spent eight days at GM. Before Richards, Susan Docherty, now GM's U.S. sales and marketing boss, led the brands since June 2008.